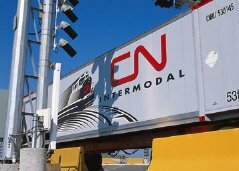 [cn] CN announced a series of capacity improvements to accommodate growing container volumes at its Brampton Intermodal Terminal (BIT) and to ensure a high level of service for intermodal customers across its system. [cn] CN announced major investments to double track key segments of its high-volume main line east of Edmonton, add capacity to its rail line to the oil sands region of northern Alberta, and improve velocity at its Walker Yard freight car classification facility in Edmonton. [alstom] On 18 May 2011, Mohammed VI, King of Morocco, inaugurated the new Citadis passenger service between Rabat and Salé, the first urban area in Morocco to operate a state-of-the-art tramway network. [alstom] On 8 May 2011, Algeria's Transport Minister Amar Tou, and the President of the Algiers Metro Authority (EMA), Aomar Hadbi, ushered in the start of commercial tramway service in Algiers, the first Algerian city to possess a modern tram network. [union pacific] Union Pacific Railroad representatives, customers and community leaders from western Wyoming today officially opened a new $24 million rail yard about 20 miles west of Green River. [union pacific] The Texas Commission on Environmental Quality (TCEQ) today presented Union Pacific Railroad with an Environmental Excellence Award for developing some of the most environmentally friendly locomotives, which are now operating in the Lone Star State. [alstom] Alstom has been awarded a contract totalling €130 million for the supply of 19 Metropolis trainsets to the city of Lima, Peru. [amtrak] Forty years ago, on May 1, 1971, Amtrak operated its first intercity passenger train and began its continuing journey of meeting America's national needs with initiative, pride and success. [union pacific] Union Pacific Railroad will continue improving Missouri's transportation infrastructure with a nearly $29 million investment to enhance the rail line that runs from St. Louis to near Morrison. [csx] CSX Corporation announced first quarter net earnings of $395 million, or $1.06 per share, versus $305 million, or $0.78 per share, in the same period last year. This represents a 36 percent year-over-year improvement in earnings per share.